Tea was one of those commodities that benefitted from the marketing that came with postcards, going back to the late 1890s. 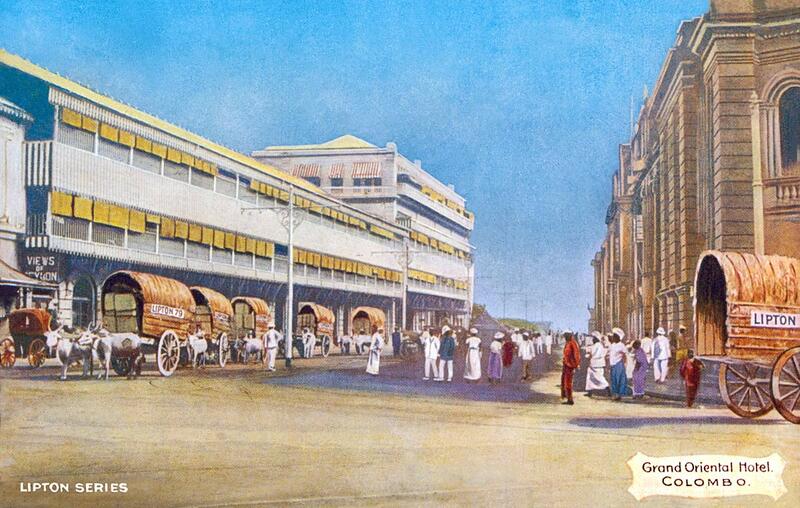 Lipton's still a big brand in the subcontinent, used postcards to highlight the whole process of tea cultivation, harvesting and transportation in carts like those show here from plantation to harbour and then onward to exhibitions and tea shops in the West where patrons could sample this novel drink for many around the turn of the century. In this case the firm worked with C.W. Faulkner & Co., a high-end London printer to publish its marketing series. Note that the fancy hotel is on the right, and the warehouse, it seems, across the street. The "Views of Ceylon" sign on the far left is intriguing – was that a postcard store?